The Flamethrower in GTA III. The Flamethrower in GTA Vice City, GTA San Andreas, GTA Liberty City Stories, and GTA Vice City Stories. Tommy Vercetti using a flamethrower in a pre-release screenshot of GTA Vice City. "Beware psychopaths and over-enthusiastic barbequers with this weapon. Fine for use in south-east Asia, but on the streets of Vice City, it is nothing but a menace. -Vice City Bureau of Investigation file description. The Flamethrower is a mechanical device designed to project a long controllable stream of fire. This weapon has appeared in every Grand Theft Auto game since the first Grand Theft Auto 1, except in Grand Theft Auto IV, The Lost and Damned, The Ballad of Gay Tony, and Grand Theft Auto V. It is classified as a Heavy Weapon in the later editions. 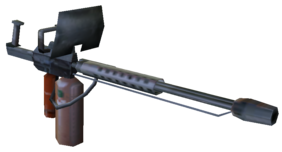 The Grand Theft Auto III rendition of the flamethrower is based somewhat on the US Army M2 Flamethrower, albeit lacking a backpack fuel tank, and adopting a rifle-like design. The renditions after GTA III are not based on any known flamethrower design, but they may be homebuilt. The flamethrower can do damage over a large area. Any vehicles or pedestrians will be instantly set on fire within range. Most pedestrians usually die when lit on fire and only the healthiest car will survive the fire. Fire can be put out by the fire hose on a Firetruck or, in GTA San Andreas, with a Fire Extinguisher. Special vehicles that are fireproofed will be immune from damage from the flamethrower. It is one of the two only weapons that can destroy a Rhino, the other being Molotov Cocktail. The flames from the flamethrower will only damage vehicles and pedestrians. In GTA San Andreas only, the flames can be created on the ground and can spread, making the fire extremely hard to put out if one is started with the flamethrower, even if only one little flame was made to start out with. The flames on the ground will not affect pedestrians but can affect vehicles and the player. If a pedestrian catches on fire, the pedestrian will usually run wildly until his or her death. If you activate the flame thrower in front of a mirror, the fire will not show up on it. Flamethrowers are mainly used in Rampages and Kill Frenzies in Grand Theft Auto 2, Grand Theft Auto III, Grand Theft Auto: Vice City and Grand Theft Auto: Liberty City Stories. In GTA 2, a Fire Truck is equipped with the flamethrower in the mission Fire Truck Fun!. In GTA San Andreas, the flamethrower is prominently used in the mission Are You Going to San Fierro? where Carl Johnson uses a flamethrower to destroy The Truth's crops in Leafy Hollow. In GTA Liberty City Stories, it is used in the mission Friggin' the Riggin', in where Toni Cipriani uses a flamethrower collected from Phil Cassidy's Fully Cocked Gun Shop to destroy fake ballot papers, Forelli Family members and vans and two printing machines. 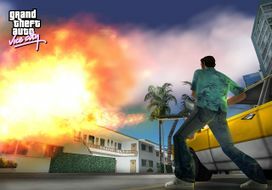 In GTA Vice City Stories, it is used in the mission Light My Pyre by Armando Mendez, who uses a flamethrower to confront Victor Vance, who ends up killing Armando in the end. Claude Speed using a Flamethrower in GTA 2. GTA Vice City, GTA San Andreas, GTA Liberty City Stories, and GTA Vice City Stories. Carl Johnson using the Flamethrower in GTA San Andreas. Mike using a Flamethrower in GTA Advance. Toni wielding a Flamethrower in GTA Liberty City Stories. Toni Cipriani using the flamethrower in GTA Liberty City Stories. Huang Lee using the Flamethrower in GTA Chinatown Wars. Harwood, Portland - On roof of the Head Radio building. It will be on a block-like object which can only be reached by jumping off the elevated train tracks. Francis International Airport, Shoreside Vale - Underneath the west end of the Shoreside Lift Bridge, near the graffitied wall. Pike Creek, Shoreside Vale - Available to buy in the unnumbered garage behind the police station after completion of A Drop in the Ocean for $25,000. Hideouts - Available after extinguishing total 20 cumulative fires on each island, 60 total, in the Firefighter vehicle mission. Starfish Island - In the swimming pool of the Rockstar House northwest of the Mansion. Viceport, Vice City Mainland - By the building near the road in the southwest part of Viceport, south of the Viceport Pay 'n' Spray. From the Viceport Pay 'n' Spray, head south along the road. As you near the road curve going east, you should see the weapon icon to your right. Ocean View Hotel, Ocean Beach, Vice City Beach - Available after collecting 40 Hidden Packages. Hyman Condo, Downtown, Vice City Mainland - Available after collecting 40 Hidden Packages and after the purchase of Hyman Condo. Vercetti Estate, Starfish Island - Available after collecting 40 Hidden Packages and after completion of "Rub Out". Flint County - Through the woods, next to some couple of shacks, near the rail tracks. Flint Range, Flint County - Inside Helena Wankstein's tool shed, after you date her. Shady Creeks, Whetstone - Deep inside the forest, near the dirt road and the dirt path crossing a shallow body of water. Doherty, San Fierro - At the construction site next to the garage, behind a collapsed portion of a building, beside a Pool Cue. Easter Basin, San Fierro - On top of the tanker where you import or export vehicles. K.A.C.C. Military Fuels, Las Venturas - Underneath a low ceiling inside the military base itself. Tierra Robada - Inside Mike Toreno's ranch after completing Vertical Bird. Hideouts - Available after extinguishing 20 cumulative fires on each island, 60 total, in the Firefighter vehicle mission. Trenton, Portland - On a roof across Joey's Garage, reachable by a ramp. Prawn Island - Spawns in the edge of an alley, above it is a Red Balloon and by the alley itself is a Burrito parked. This page was last modified on 1 August 2018, at 17:39.